On a recent Saturday, my wife and I took a four hour car trek to Hillsboro, New Hampshire to visit friends and have a bit of an adventure: we packed overnight bags not knowing where we'd stay - or if we'd stay somewhere - that night. We used an app called Hotel Tonight and hoped to find an inexpensive place to sleep instead of hell-for-leathering it all the way back to Stamford. As it turned out, we found a cheap but very nice hotel in Bedford Massachusetts, which is very close to the towns of Lexington and Concord. I'm not a big student of history, but I understand there was some kind of famous battle in the area. After settling in to our room, my wife and I went to downtown Concord to look for people wearing period costumes and, equally important, find a place to eat. Between spotting a guy in a tri-corner hat and us eating (and enjoying the live music) at Main Street Market & Cafe, she sketched while I fixed and rode on a bike I purchased a few hours earlier. I'm not sure what rural New Hampshire town brought this tag sale gold to me, but I am thankful: it's a Diamondback Venture road bike with 700c wheels, a working frame pump, a seatpost bag containing three tire levers, a rusty Allyn wrench, and two new tubes. 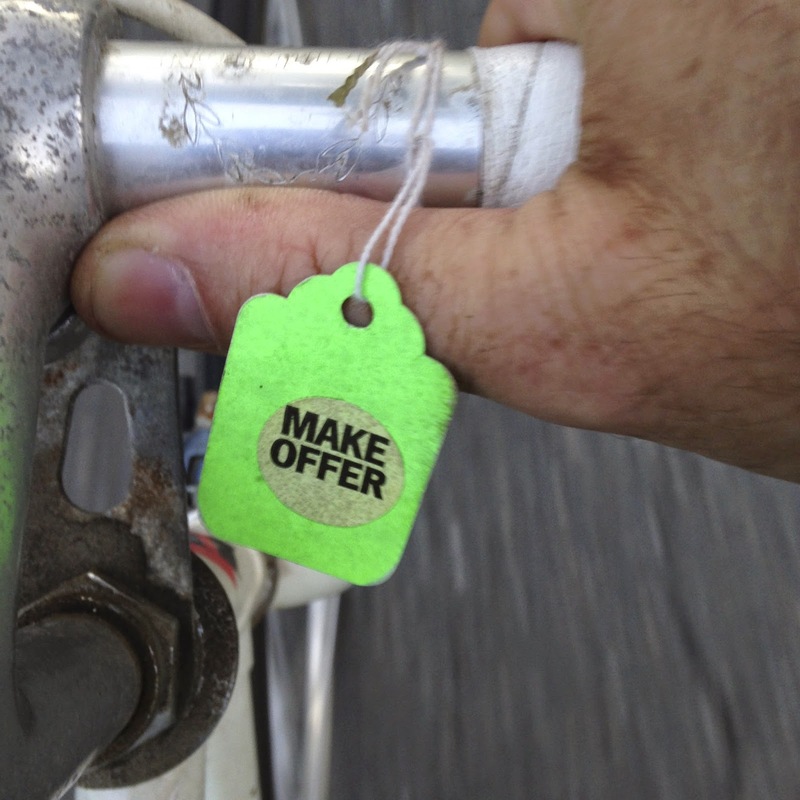 If you look closely you'll see the green 'Make Offer' tag still hangs on the handlebars (my offer was $5) and after I spent a few minutes using the aforementioned tools to get the bike to working order, I took it on a ride around Concord. I did not ride it as far as I wanted or as I dared: when inflated, the front tube would try to ooze out of the space between the near-rotted tire and the rim which isn't ideal. Still, just for this one night I felt like I got my $5 worth (mainly because fixing it and riding it gave me something to do while my wife sketched) so as my wife's watercolors dried I put the bike back in the car. The next morning, we checked out of our room and agreed we needed to get a move on to return home in time to attend an opening reception at the Rowayton Arts Center (which is hosting a Chantey Sing at 6:30 tonight, by the way). On the drive through Lexington, while looking for a place to have breakfast, something caught my eye and made me park my car with extreme prejudice. Ride Studio Cafe in Lexington. 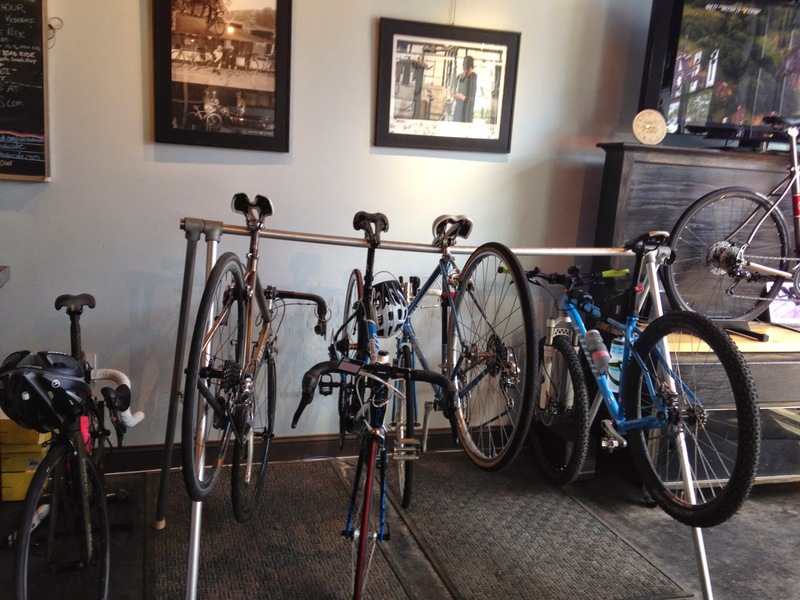 Now while I wrote rather admiringly about biking in Boston a couple of years ago I have to say I have little interest in living in that part of the country (you know…cobblestones, Massachusetts drivers, and so on) but right then and there I saw paradise in Ride Studio Cafe. 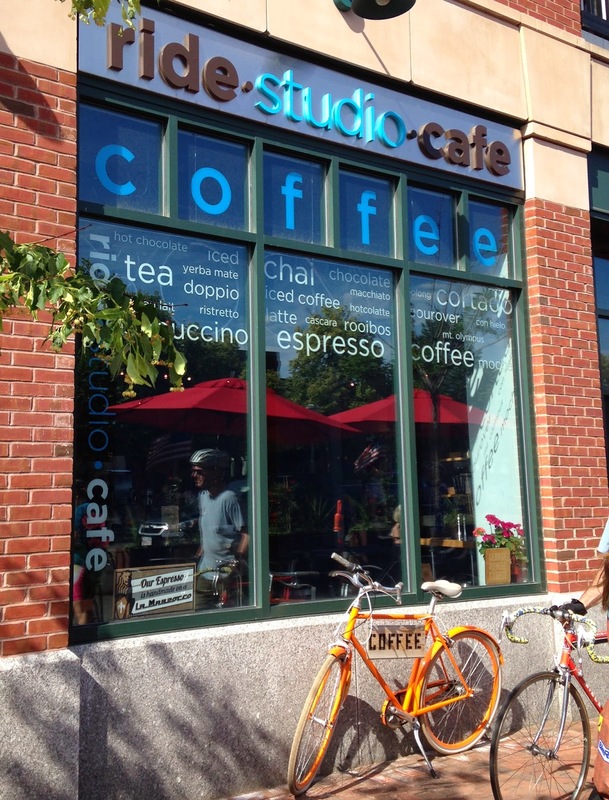 If I had money and talent I'd open a similar place in Stamford: Coffee and bicycles. Two passions combined into one beautiful whole. Keep your eyes in the right two-thirds of the joint as you head in and you'd think you were in a nice bike shop - one that features indoor parking. This was taken at the communal table between the bike rack and the counter where my wife and I order coffee for me, tea for her and breakfast for us both. 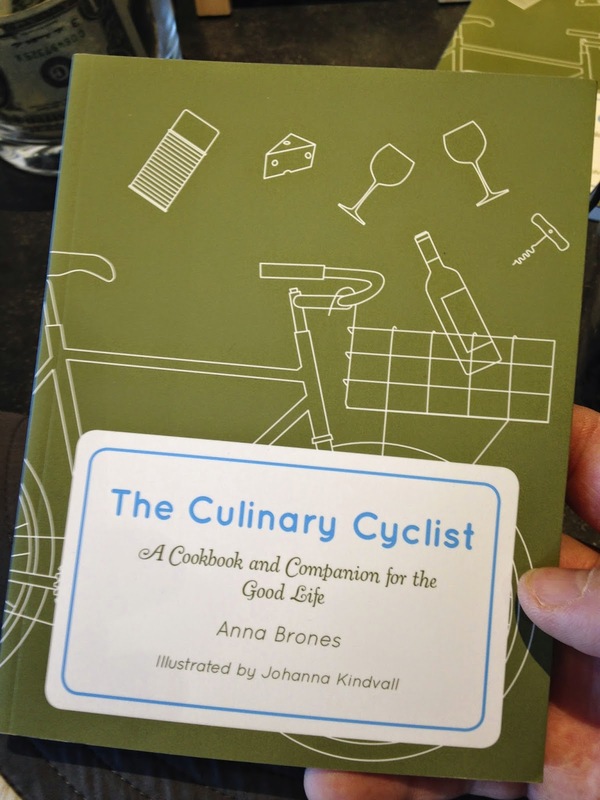 Were I a man of means I'd have ordered a carbon fiber frame to go, but my budget would only allow the purchase or something a little less expensive: The Culinary Cyclist by Anna Brones. The friendly vibe of the place was well represented in the woman who sat across from my wife and I while we were waiting for our order. Her name was Denise, and when the 'what-do-you-do?' part of the chatting began it was revealed that her title is president of sales recruiting firm DANA Associates. It was from her I learned of the existence of a job that made me wish I was among the bicycle/coffee/history-loving crowd in that area: a nearby adventure travel company that does bike tours of Italy, France and other countries is searching for a Selling Team Leader. The job, which would pay $60K annually plus bonus, would involve selling these tours and the opportunity to go on them. The job is for a skilled salesperson (70% of the job is sales while the rest is managing people and maintaining a database) and a passionate cyclist who loves travel. Since my sales experience is limited to typo-laden eBay listings - though deciding how many exclamation points should come after the words 'NO RESERVE' is an unsung skill - I did not push the conversation with Denise toward my LinkedIn profile. What I did do is realize that this job cannot go unfilled for too long, for leaving a sales chair vacant at whatever company this is means someone might miss the chance to hear about and take a life changing cycling adventure. And as you all know from my recent trip to India, I am a big believer in life changing cycling adventures. So if you are a passionate cyclist and a skilled salesperson who wants to come up on the winning side of a career coin toss, I recommend you contact Denise directly at dbg (at) danaassociates.com. 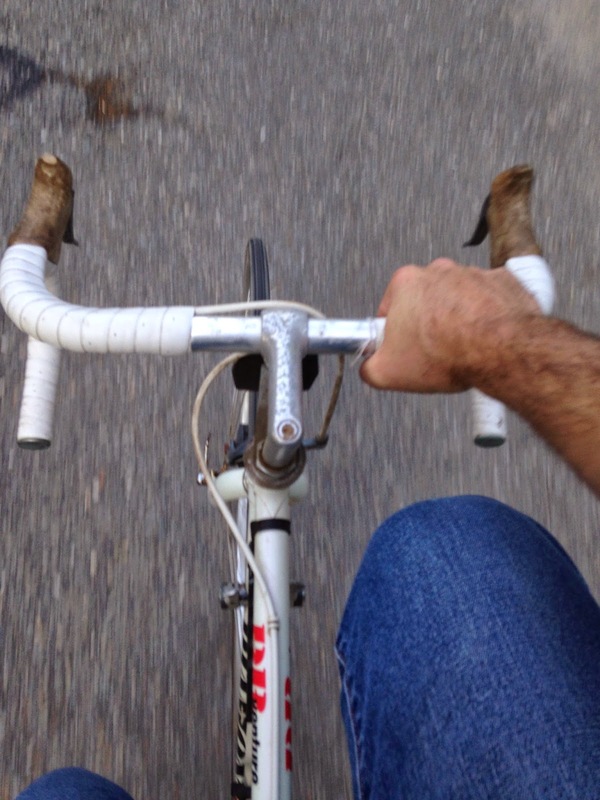 If you are just a passionate cyclist, you should instead visit Lexington - a place I will return to one day. If you are a passionate traveler, pack an overnight bag, hit the road, stop at tag sales, talk to strangers and don't avoid communal tables - especially at Ride Studio Cafe. Thanks for reading and thanks for riding. With this information the salesman also knows which of his products will basically work effectively for the consumer, Salesperson Jobs making the right recommendations, and thus, reliability is recognized.